Products by TREC NUTRITION contain the best active components in high doses at reasonable prices. Today TREC NUTRITION offers its customers a range of products that is the broadest, the offers the best quality and has the most competitive prices on the Polish market. The experience which the company has gained for years of cooperation with the best shops specializing in the sales of supplements for athletes has made it possible for the firm to prepare a professional and complex response to the growing demand of the market. The suppliers of the products for TREC NUTRITION are the world's best laboratories recommended by the leaders in the field of supplements, whose work is supervised by regulatory authorities including FDA (Food and Drug Agency). FDA certificate guarantees health safety of the products. The same components which are supplied to TREC NUTRITION, are also used by other American companies, such as : Weider, EAS, Met-Rx, Prolab and Twin-Lab. The production processes in TREC NUTRITION are conducted with the use of highly developed technologies. The machine park in TREC NUTRITION is one of the most modern ones in the business, it is also equipped with a very functional and modern assembly line for capsule manufacture. It is a priority for the company to develop the newest production technologies and obtain unique formulas, that is why it employs Poland's best technologists and laboratory technologists, who develop specialist product formulas. What is more, the company's long-term partner is J.S. Hamilton Ltd, an analytical laboratory specializing in food analysis, which objectively and independently (aside from the lab technologists employed with the company) verifies and confirms the product content and quality. TREC NUTRITION products are manufactured in compliance with modern tendencies and standards of biotechnology and sports medicine today. The company constantly cooperates with the largest research centres in Poland, such as Medical Universities and Universities of Physical Education. Since its very beginning on the Polish market, TREC has followed and kept up to date with the strict guidelines of GMP (Good Manufacturing Practice) and GHP (Good Hygiene Practice). These guidelines make it possible to secure hygiene-related work conditions and to monitor microbiological, physical and chemical hazard which can be anticipated and controlled thanks to appropriate work organization. 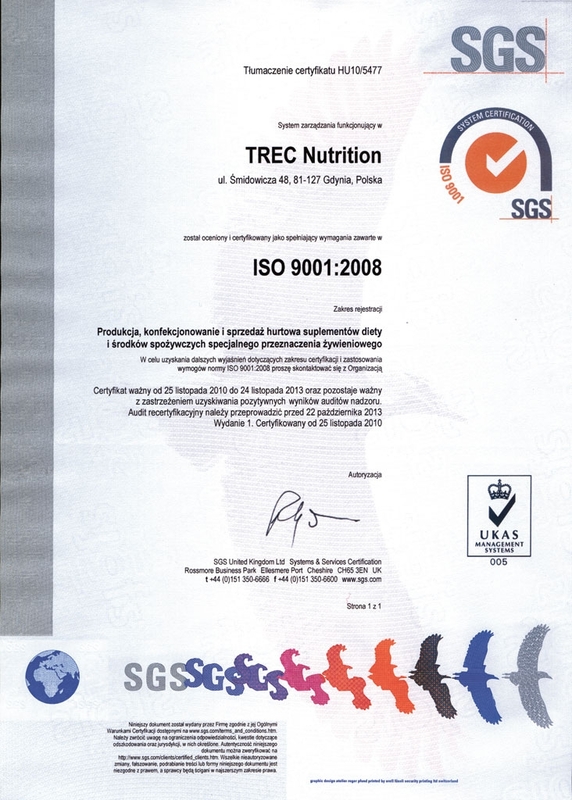 All TREC NUTRITION products are manufactured in compliance with legislative requirements of the European Union. The company strictly follows all legal and regulatory acts which are applicable to the business. What proves the exceptional care for safety of the manufactured products are the ISO 22000 norms implemented and followed in TREC NUTRITION production plant. The requirements have been developed by the experts at food industry in cooperation with specialist international organizations, including Codex Alimentarius Commission which has been established to develop food standards by The United Nations' Food and Agriculture Organization (FAO) i World Health Organization (WHO). ISO 22000 is a document which lists the requirements relating to implementing, functioning and improving management system which is aimed at delivering safe products to clients. This international standard combines the requirements of HACCP, GMP and GHP and its objective is ensuring that environment, work conditions and staff behaviour are determined by high level of hygiene, sterility and quality. 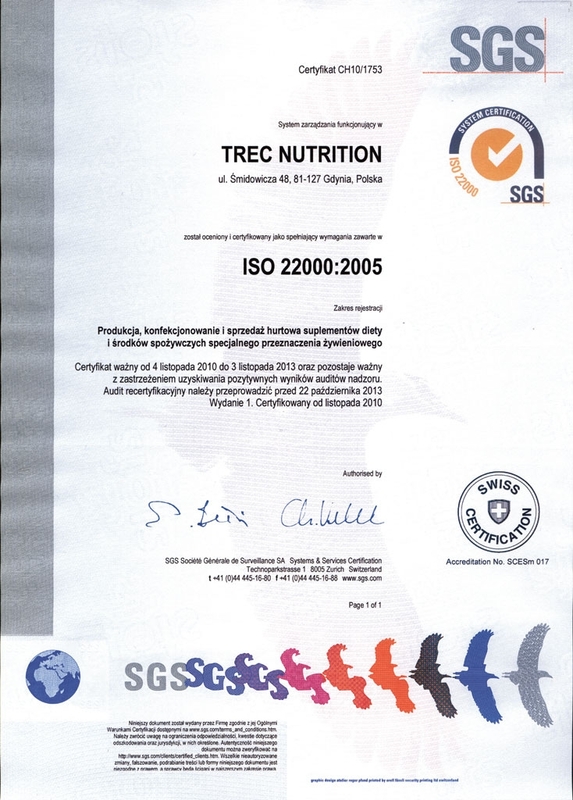 The certificate confirming the compliance of the company activity with ISO 22000 requirements has been awarded to TREC NUTRITION by SGS – world's best Swiss company which undoubtedly is the leader on convenience food market in inspections, verification, tests and certificates. 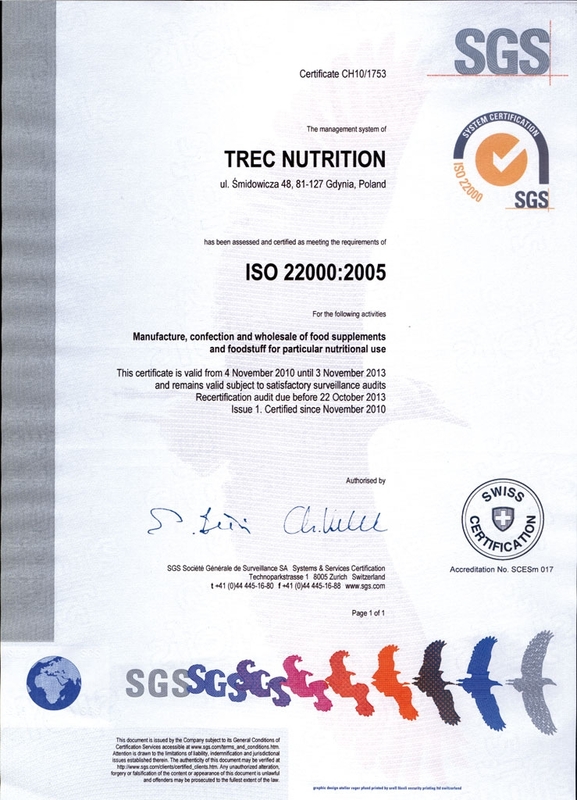 It is a significant achievement to pride in, as TREC is the first company in the supplement business in Europe to be certified by such a prestigious authority as SGS. 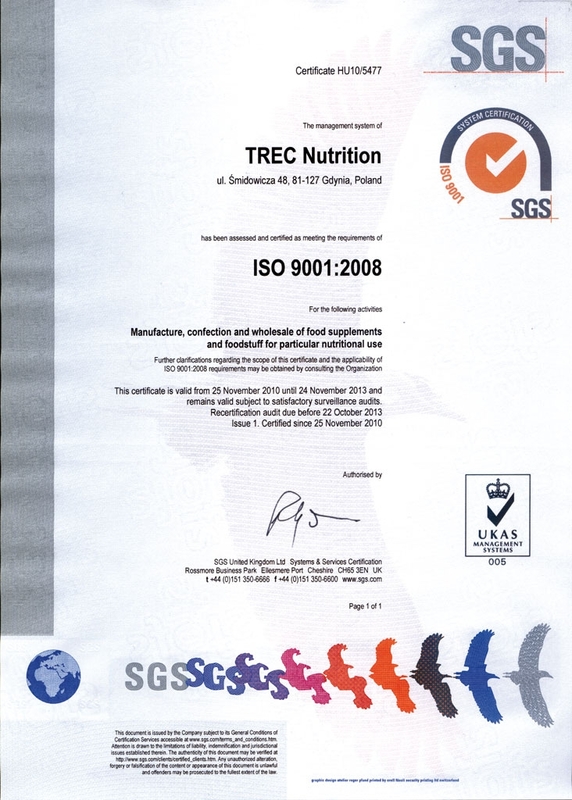 For years now TREC NUTRITION has followed and constantly improved a quality management system compliant with ISO 9001. Thanks to the system and high quality awareness of its staff, the company ensures the highest standards of work organization and customer service. 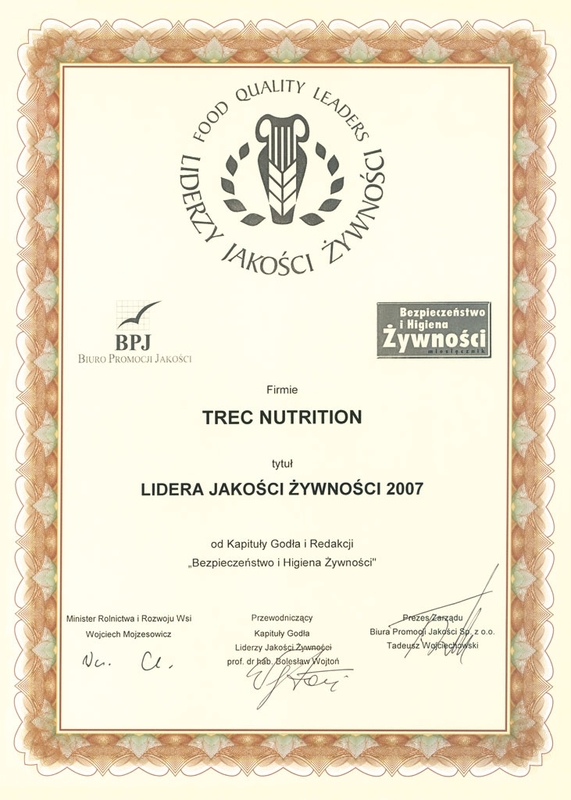 In order to acknowledge the quality achievements, TREC NUTRITION has been awarded by POLSKA AKADEMIA JAKOŚCI [Polish Quality Academy] with the title of LIDER JAKOŚCI [Quality Leader] 2007, and by BIURO PROMOCJI JAKOŚCI [Quality Promotion Office] – with the title of LIDER JAKOŚCI ŻYWNOŚCI [Food Quality Leader]. 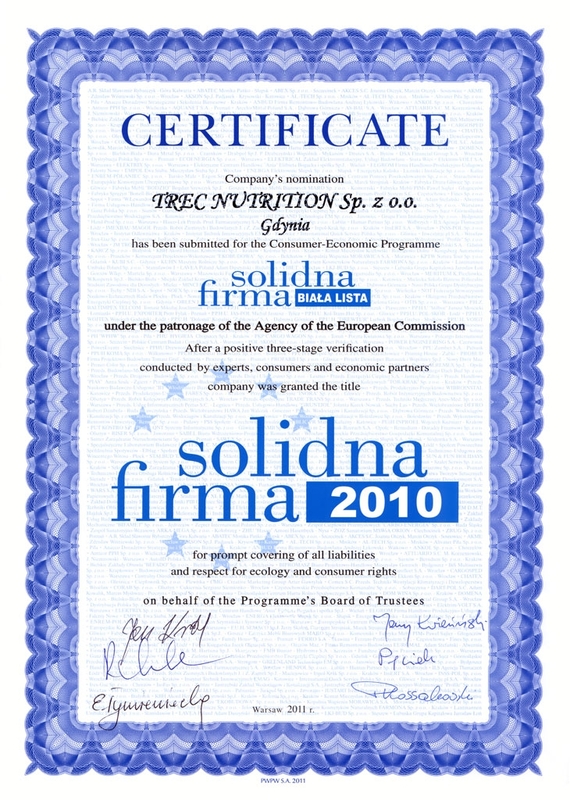 What is worth noting here, is that TREC NUTRITION is the first and the only company in the supplement business to be granted SOLIDNA FIRMA [Reliable Business] title, which is yet another proof of the company's care of quality and consumer satisfaction and is in keeping with TREC's clients' opinions that TREC is a trustworthy, stable and reliable business partner. 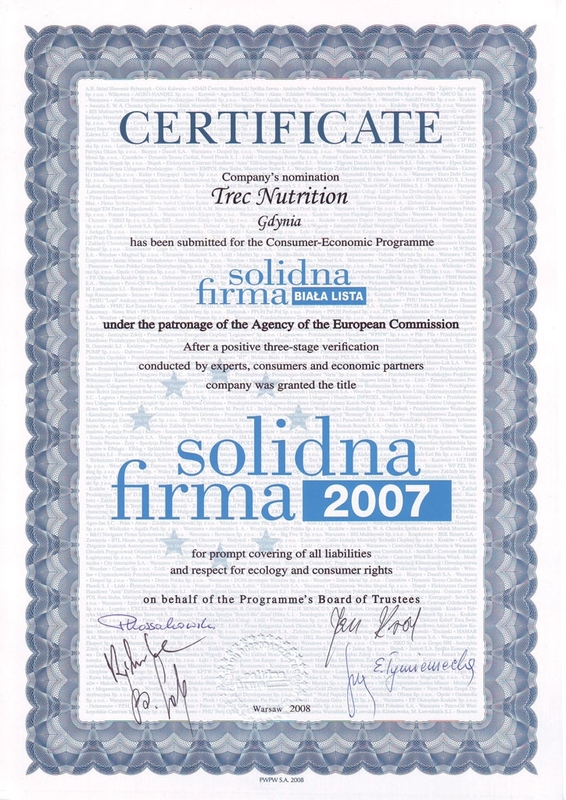 The Solidna Firma Consumer-Economic Program has been conducted for 6 years. The objective of the undertaking is promoting the companies which consider business ethic rules such as fairness, promptness and thoroughness in theirs contacts with partners as important as the profits made. All products offered by TREC NUTRITION are verified by independent research centres and notified to Sanitary Inspector General as newly marketed products. The company is under constant supervision of all levels of sanitary and epidemiological inspection, and all product components are verified for their legality of use and effect which they have on human health and body. The actions above are not commonly performed by other producers and distributors of dietary supplements on the Polish market (even though they are obligatory!). TREC NUTRITION management are extremely concerned with the legality and safety of the products, that is why the mission of the company is delivering the best, the most effective and the safest products in the group of dietary supplements and nutritional foods for athletes. To us, the highest value is human health, and we accept no compromise here, as human health is more important than a moment of satisfaction. 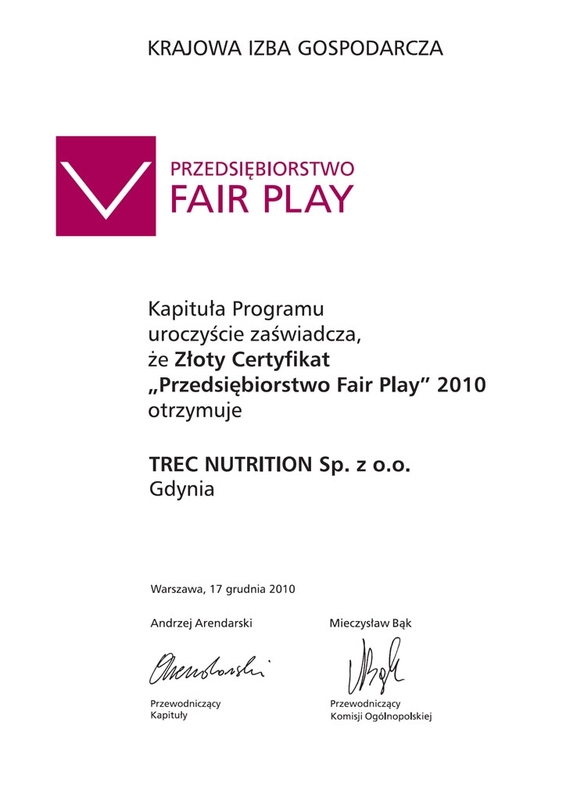 For two years now TREC has been an active member of the Polish Council for Supplements and Nutritional Foods – an organization which represents and supervises its members – the largest manufacturers of dietary supplements and is also the coordinator and review board of new legal acts, as well as hygiene and sanitary regulations both on the domestic level and also - via cooperation with EFSA (European Food Safety Authority) - in the European forum. Apart from great concern with product quality and safety, the company does not forget about other aspects influencing its activities and shows exceptional organizational etiquette, also in such fields as preserving natural environment, and work hygiene and safety.